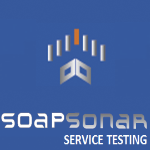 SOAPSonar is a software testing and diagnostics tool for SOAP, XML and REST based Web Services. The core focus is on functional, performance, interoperability, and security testing of service endpoints by performing client simulation and automated generation of client messages. Service and API Testing. HTML, XML, SOAP, REST, and JSON. Test over HTTP/s FTP/s, SFTP, IBM MQ, Tibco EMS, Weblogic JMS. Comprehensive standards support for OASIS and W3C standards.